Glo, Porcelain Rose, recently asked how the pond is so I thought that as I’ve just tidied both of them, and their surroundings, I’d do a post on them. When I took the plot on I wanted a small pond and used an old green washing up bowl which is half filled with stones. It’s situated near the log pile on the wild patch, and I’ve been lucky to see, and photograph, a couple of Frog Newtons* in it. I’ve also seen a fox drinking from it. That’s about it apart from a few snails as it is mostly hidden from view. The other pond is a large green plastic dustbin lid positioned on the edge of the flower bed. This one is filled with small stones, and all I’ve ever seen in it are bees drinking. To the left is the foot high oak tree, at the right of centre bottom can be seen a few about to flower primroses and along the top edge are some lilies. On arriving at the plot I always check both ponds and top up with water if need be. What I’d really like to see on the dustbin lid one is a colourful damselfly which I have seen flying around on some summer days. Happy ponderings, and have a good weekend! What a tiny little frog, you could have easily missed him. 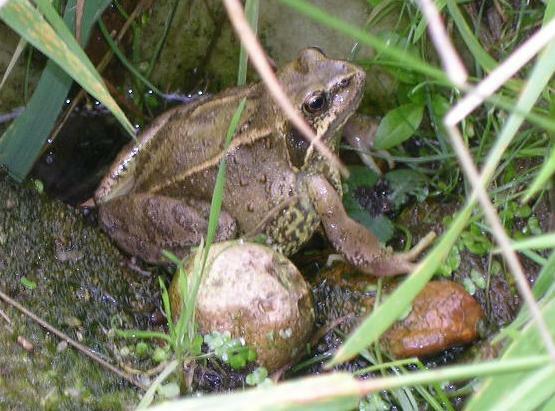 The pond I have in my garden is very small, but it’s amazing what wildlife it attracts. 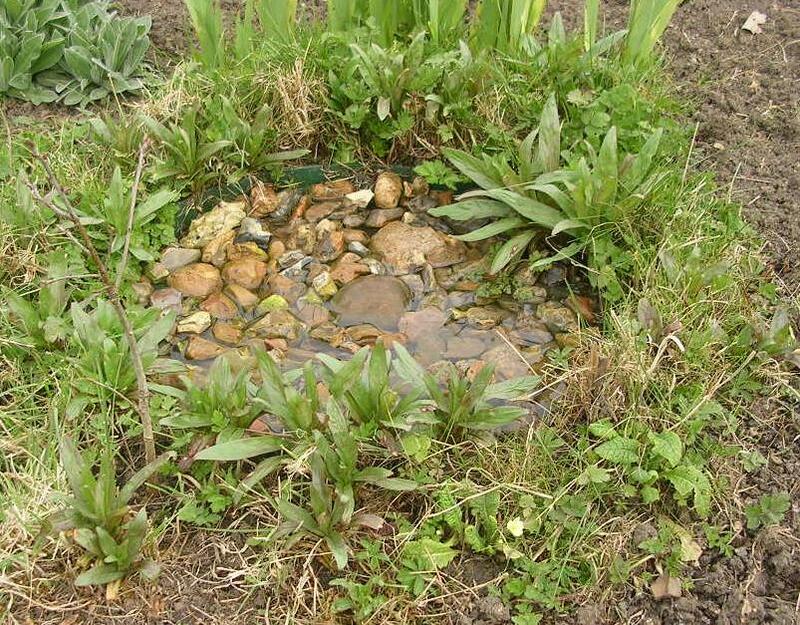 I should really get a small pond installed on my allotment, that’s given me something to think about. Thanks for the update, Flighty. So cute that little froglet! Hey, I just saw a map of the allotment and your street — you really are quite close. 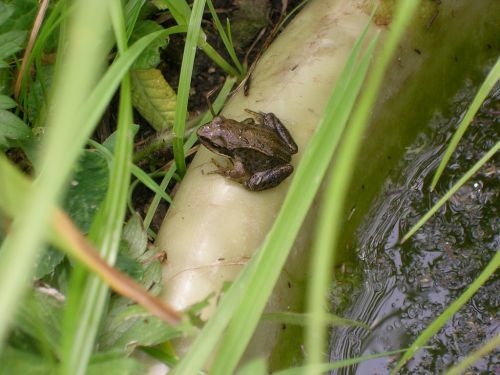 The frogs are lovely, although I can’t help but jump every time a frog or toad jumps up from where I’m gardening…. Glo thanks! These are photos from the Frog Newton days. I’ll take more photos when the flowers bloom. We used to have one in a Belfast Sink, but that’s a water trough for the pigs now. I miss it. We do, however, frogs and toads around the garden. There are some that appear to live in the Heather. Mo thanks! Yes thanks a popular choice to use. A plot neighbour has a bigger pond where they spawn and live. I recall you posting about the development of the bowl and dustbin lid ponds. Who would really know from a distance what the linings are for your water features. These are doing ever so well. The frogs obviously enjoy the additional watery home you have given them and other wild life have watering stops provided. Simple ideas are often the best. You’ve inspired me with your ponds! I like to see what’s happening in the wildlife pond at my local City Farm (lots of mating frogs there last week!) but it never occurred to me to put a teeny one in to the Veg Patch for the kids. They’d love it! Is it too late to start one this year, do you think? Carolyn you’re most welcome, and have fun tomorrow. Have a good weekend Flighty, those are great ideas for ponds. When the children are a bit older I’d like to add one to our garden as they attract so much wildlife. Damo thanks, you too! Good idea, and as you say they’re great for wildlife. the plot is green again after the snow, spring time. yay! good to see the frogs are having a good time in the pond too. I like to see a Genius & this is FaB ! Flighty those pictures are lovely. 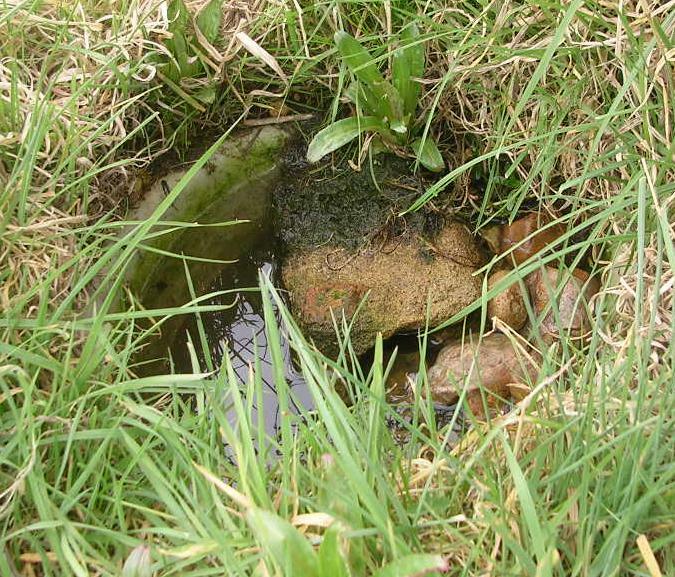 Since reading your post we have decided to make a smallpond in the back garden i cannot wait i just love frogs. We had a lovely pond before we moved i really do miss it so i am inspired again now thank you .